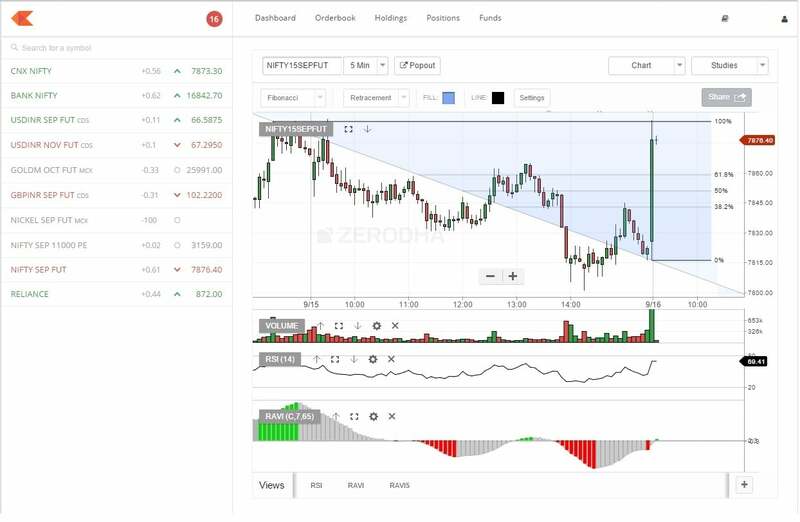 Apart from being pioneer of the discount brokers, Zerodha also has a repute with the high analytical tools and the hi-tech and smart trading platforms that it offers. Zerodha Kite Web is one of them. 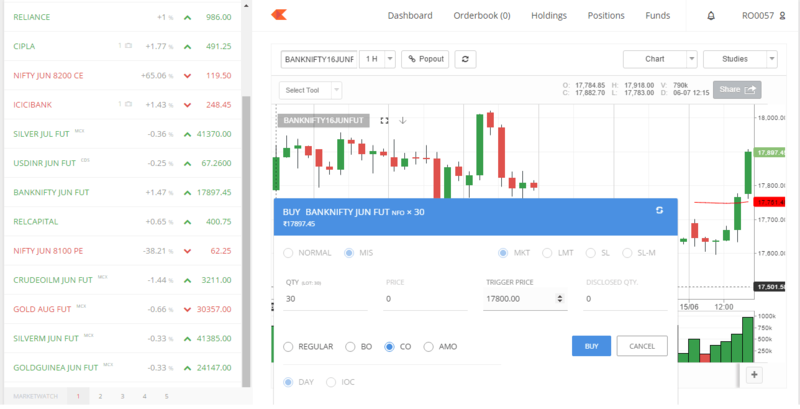 Lets have a detailed review of Zerodha Kite Web Trading Platform. As the name suggests, it is a web based trading platform. So, on becoming a member of Zerodha, the customer is shared certain credentials which contains a login ID and password to access Kite. This is a multilingual platform i.e. has multiple language options and thus can be said to be user friendly. The first screen that appears after logging resembles a summary table of your holdings. This is referred to as dashboard. The dashboard shows a summary of the total investment made, the margin money available, the margin money utilized, the details of positions undertaken, the order details. Apart from the details of current holdings, the dashboard also gives details of the scrips held in form of a rectangle chart. This chart is editable so as to show the quantum hold, the profitability from each scrip or the amount invested in that scrip. The last section of the dashboard shows the position taken by each scrip. Apart from the details of current holdings, the dashboard also gives details of the scrips held in form of a rectangle chart. This chart is editable so as to show the quantum hold, the profitability from each scrip or the amount invested in that scrip. The last section of the dashboard shows the position taken by each scrip. Apart from the details of one’s holdings, this screen also exhibits a market watchlist. The customer can customize the list for favorite scrip or the scrip that one wants to follow and observe. This market watch list is a multi-market and multi asset watchlist. This watchlist not only reflects the current price but also shows the increase decrease percentage. This watchlist also lets one see the market depth of a scrip which shows the top 5 bids made for scrip. It also helps to check a performance chart of that scrip for last 5 days – this is known as stock widget. Watchlist feature is also a shortcut to place a buy/sell order. Apart from this, the customer can move to the order tab and place the request for order therefrom. To ensure enough authentication, Zerodha asks for a transaction password everytime after a re-login. Kite Web has different tabs for reviewing ones order book. Reviewing and looking in details on the holdings, the positions held and details of the funds. One can have multiple tabs open at the same time. Kite also offers extensive chart designs for analytical purposes. It also has features to compare scrips by way of charts. The Kite Web platform is also available as a chrome extension. This means that while a customer is surfing on any website, he she can login to kite by simply clicking on the extension. It also provides quick buy and sell buttons while surfing websites like Yahoo Finance and Google Finance. 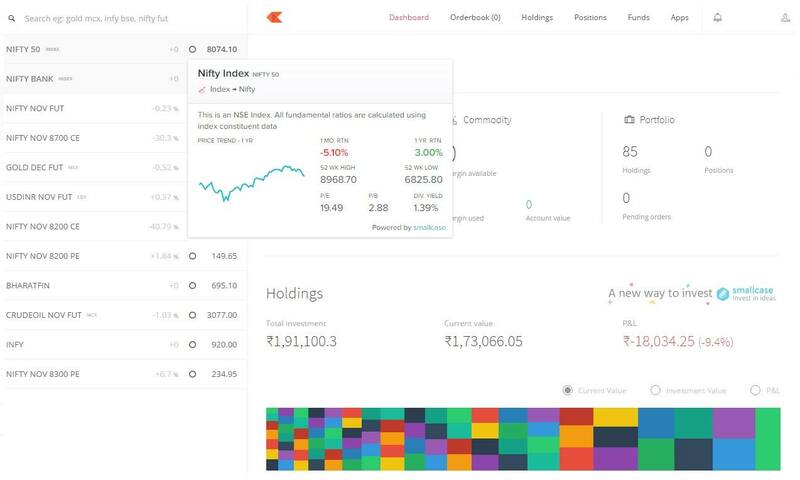 Zerodha has also put up some videos to help its customer in getting comfortable with the interface. Kite Web is one of the most used web based trading platform in the country. In terms of both performance & usability it is considered to be the best web based trading platform.